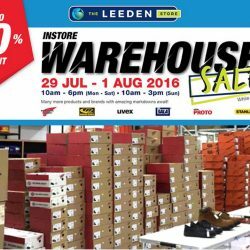 29 Jul - 1 Aug 2016 The Leeden Store: Warehouse Sale Up to 80% OFF Red Wing Shoes & more! The Leeden Store's long-awaited Warehouse Sale is here! Join the sale over the weekend from Friday, 29th July 2016 to Monday, 1 August 2016 for absolutely crazy discounts on personal protective wear, fall protection, hand tools, power tools, and of course, Red Wing Industrial Safety Footwear. Everything must go!